On 10 July 1969 a project called Alpha Jet was started by the governments of Germany and France to cooperatively create a light aircraft for advanced jet training and for the tactical support role. The contenders were the following: Dassault-Brequet joined up with Dornier with the TA-501, AÃ©rospatiale with MBB with the E-650 Eurotrainer and VFW with their own T-291 project. On 23 July 1970, the TA-501 project from Dassault-Dornier was selected. On 26 October 1973 prototype 01 made the first flight, sixth months ahead of the contract scheduled date. The official presentation flight was flown on 23 November in 1973 at Isres, France. On 9 January 1974 the second prototype made its maiden flight, followed by prototype 03 on 4 May and prototype 04 on October 11th. Alpha Jet E entered production in 1977. The German Alpha Jet A entered production a year later. 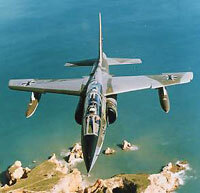 The German Luftwaffe was the sole operator of the Alpha Jet A light attack version until the 1990s. The first production aircraft flew in 1979 and three years later Dornier closed the production line. The 175 Luftwaffe Alpha Jets replaced the Fiat/Aeritalia G.91R, of which 300 were operated in the tactical support and light attack role. In the 1990s the Alpha Jet was slowly withdrawn from service, the last example being officially retired on 31 December 1998. A large number of aircraft was sold to other nations and about 40 aircraft were put into storage at FÃ¼rstenfeldbruck. Two examples have been bought and restored for flying with the Flying Bulls, a display team sponsored by Red Bull. The Alpha Jet E trainer version for France entered service with the ArmÃ©e de l’Air replacing the obsolete Fouga Magister, Lockheed T-33 and the Dassault MystÃ¨re IVA. The ArmÃ©e de l’Air continues to operate the Alpha Jet today. 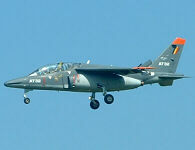 The Belgian Air Force needed an advanced trainer and was interested in the development of the Alpha Jet since the start of the project. Belgium continues to operate 28 aircraft, which have been upgraded prolonging their service life until at least 2015. The upgrade was carrier out by SABCA (SociÃ©tÃ© Anonyme Belge de Constructions AÃ©ronautiques), the first upgraded example being delivered back to the air force on 21 April in 2000. The upgrade features a new stick, advanced HUD, GPS, ILS and a multi function display in the rear cockpit.